Russell Westbrook had 34 points, 10 rebounds and nine assists in a win Wednesday night. 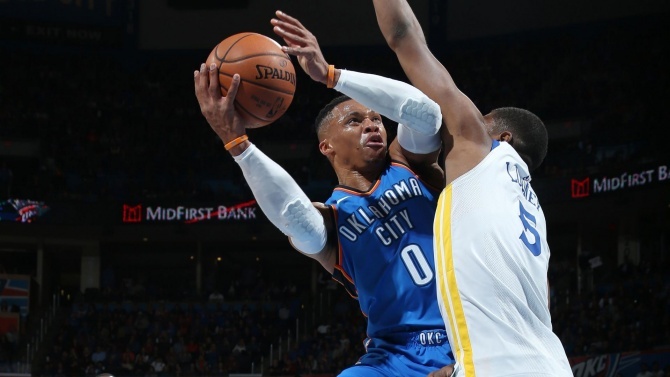 Anyone who saw last night’s matchup between the Warriors and Thunder in Oklahoma City could tell guard Russell Westbrook was more than ready for this one for a number of reasons. The Thunder star and reigning Kia MVP was looking to get his team on track after a two-game skid. He wanted to show off his new teammates — Paul George and Carmelo Anthony — against his old rival. And, of course, he wanted another crack at former teammate Kevin Durant, too.